about this book: Do you sometimes wish to muse on something? Would you like to remember some interesting thoughts that have once come to your mind and keep them in some interesting way to return to later? Don't you think that just noting down in an ordinary notebook is a way too traditional and a bit boring? 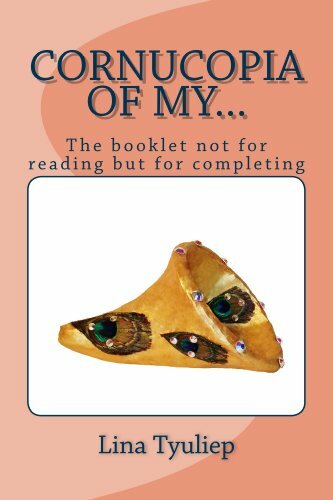 If you like to make notes and wish to add some creative touch to them, then you could take interest in the booklet "Cornucopia of My...". In 2011 Lina Tyuliep created two booklets under the title "Cornucopia of My...". In the context of the booklets the word cornucopia is used as a synonym for the words many, abundance, etc. Front covers of both booklets have illustrations of the cornucopia created by the author. Inside the booklets you will not find any Table of Contents, texts, pictures, or questions to write answers to. These booklets are created not for reading but for completing. The first page following the title page is for filling out with your personal information ? name, age, etc. The rest of the pages are double-page spreads with lined pages on the left side and blank pages on the right side. The lined pages are meant for making notes on any theme, for example: "My Favorite Quotes" , etc. The right side blank pages are for making illustrations of the content set out on the lined pages. You can use your own drawings, pictures you like, stickers and so on as a kind of illustration. As a matter of fact, both booklets have the same function, but they slightly differ. The front covers of the two booklets have different pictures. The pink cover booklet contains introductory phrases on all the pages, whereas the peach color booklet does not have them on all its pages, thus making it possible for the booklet user to decide himself/herself what headings, if any, to put at the top of the pages. You could complete the booklet with your own content and creative illustrations at your leisure time or when it suits you.